We had 3 couples sharing a 3 bedroom apartment. It was a great apartment in a good location. Very very nice. Nice, large apartment well situated. Only 10 minutes or so walk to the Esplanade. Many restaurants nearby. Nice and quiet. Would stay there again. location is excellent, short walk to restr., shopping and boat. Location, views from every room and the size of the apartment. Bed was really comfortable, apartment was really spacious. 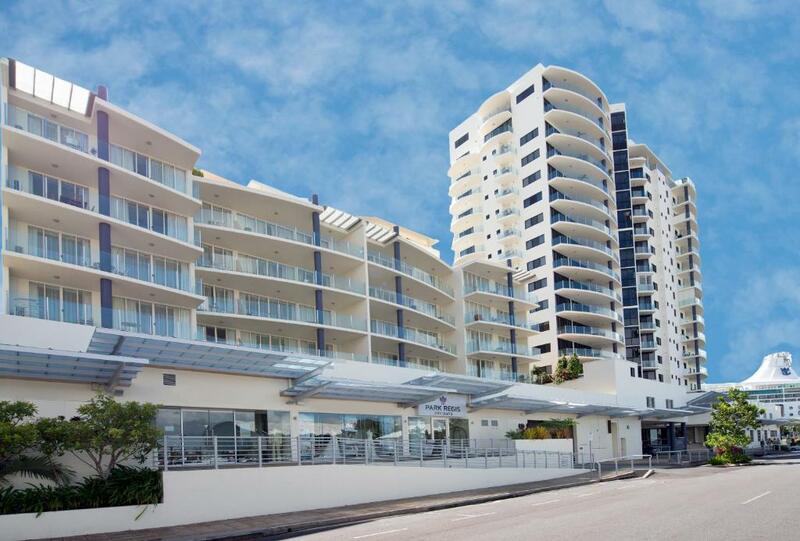 Lock in a great price for Piermonde Apartments Cairns – rated 8.8 by recent guests! Piermonde Apartments Cairns This rating is a reflection of how the property compares to the industry standard when it comes to price, facilities and services available. It's based on a self-evaluation by the property. Use this rating to help choose your stay! One of our top picks in Cairns.Located opposite Cairns Convention Center, each Piermonde Apartment features a balcony offering river views. Guests enjoy an outdoor swimming pool, a spa pool and 250MB of free in-room WiFi per day. The property is a short walk from Cairns Esplanade. Marlin Marina and many restaurants and bars are within walking distance of the hotel. Cairns Airport is a 5-minute drive away. 뀐 Located in the top-rated area in Cairns, this property has an excellent location score of 9.3! When would you like to stay at Piermonde Apartments Cairns? This spacious, modern apartment features a balcony, 2 bathrooms with a spa bath, plus a fully equipped kitchen and laundry facilities. Ideal for families and groups, this large 3-bedroom apartment features a spacious balcony, 2 bathrooms with a spa bath, plus a fully equipped kitchen and laundry facilities. This apartment features 2 bathrooms with a spa bath and a balcony offering city and mountain views. Featuring modern décor, it also offers a fully equipped kitchen and laundry facilities. This apartment features 2 bathrooms with a spa bath and a balcony offering sweeping water views. Featuring modern décor, it also offers a fully equipped kitchen and laundry facilities. This opulent 3 bedroom apartments features pool views. It features two and a half bathrooms with a large spa bath in the main bathroom. There is a very spacious balcony with views overlooking the swimming pool, a fully equipped kitchen and laundry facilities. Please note that the price is based on 6 guests. Maximum occupancy is 7 (see 'Policies' section). Piermonde is a self-contained an apartment style hotel, which offers 2 & 3 bedroom apartment with large living area, huge bathrooms with spa or jet baths, full kitchen and laundry facilities. Piermonde Apartments is located within just walk in distance to the Cairns Convention Centre, and also convenient to shops, restaurants, harbour foreshore, the Esplanade, Night Markets, Marlin Marina and Reef Casino. House Rules Piermonde Apartments Cairns takes special requests – add in the next step! Piermonde Apartments Cairns accepts these cards and reserves the right to temporarily hold an amount prior to arrival. Please note that a credit card guarantee is required at time of booking. Please note that the hotel will process the full accommodations charge onto your nominated credit card 48 hours prior to arrival. All nonrefundable, prepaid rates will be charged upon booking. The hotel reserves the rights to cancel reservations on declined credit cards. Please note that Piermonde Apartments Cairns requires a AUD 250 credit card pre-authorization upon check in to cover any incidental charges. The person registering at check-in must be at least 18 years of age and must provide a valid photo ID and credit card. The ID and credit card must be in the same name as the guest's name on the booking confirmation. A record and/or copy of this ID and credit card may be retained to minimize the risk of fraudulent usage and for verification purposes. Please note that there is a 0.8% charge when you pay with a Visa, Mastercard or BankCard credit cards, a 3.35% charge for bank issued American Express credit cards and a 3.5% charge for American Express and Diners Club credit cards. Please note that this property’s reception desk is located at Park Regis City Quays, next door at 6 Lake St, Cairns. Please contact the property in advance to arrange check in, using the contact details found on the booking confirmation. Reception opening hours are 06:00 to 22:00 hours. Guests arriving outside reception opening hours can check in using the hotel's check-in machine. To receive the password, please contact the hotel prior to arrival using the contact details found on the booking confirmation. Please note that guests receive 250MB of free in-room WiFi per day. Additional MB usage will incur additional charges. It was a little dusty in parts of the bathroom. We had a very spacious room overlooking the wharf. It was very comfortable for all 5 of us. We got an extra bed for our third child which fit fine in the 2nd bedroom so the kids were altogether. We've stayed at a few different places in Cairns and this is one of our favourites. Great apartment on the third floor with balcony access to the pool. Big apartment, well kitted out, very comfortable, clean and great location. I will definitely stay here again.. apartments easily big enough for 2 couples which I will remember next time and save money.! The hot water to the shower took a long time to run. The blankets were located in the single bed bedroom rather than being easily accessible in both the main bedroom and the second bedroom. The apartment was well appointed and spacious. The kitchen was well organised and complete with appliances. The apartment was equipped with two bathrooms. We were blown away by the apartment. It was bigger than expected or needed and access was perfect. The flat was very spacious and perfect for what we needed. 1 bedroom aircon not working at all , main bedroom aircon hardly worked . Front reception unorganised.